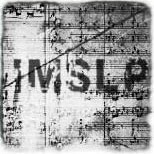 The IMSLP housed over 15,000 copies of public domain scores that were available completely free as downloadable documents. The service was literally priceless, especially to people, groups, and organisations that did not have the financial resources to buy reprints or compilations of these public domain documents. Approaching a year ago, on October 13th of 2007, IMSLP was forced to shutdown their noble project because of pressures from countries that were still making money off of these documents (As you may not know, copyright lengths vary from country to country). Because IMSLP was being operated by a group of individuals without tremendous resources they, no doubt wisely, decided to take the IMSLP offline until they could muster background information, new ideas, and support for the project. On 11/06/2007- Copywronged- International Music Score Library Project The Latest Victim Of The International Copyright Police. On 05/13/2007- My students listed the IMSLP as one of the“great music websites” available on the internet. Hello Feldmahler and imslp.org,I’ve been an active user and advocate of imslp.org for a number of months and am very unhappy to hear about the issues you are having keeping your site active. I wanted to let you know that I and the people at mustech.net would like to extend any help that we can to you or those that you would deem as responsible as taking over the site from you all. Please let us know what we can do to help. You can contact us via the contact page of our site and I will get back to you all as promptly as I can. Best wishes for CONTINUED success and thank you for your efforts for all of us! I am greatly anticipating the return of this WONDERFUL, FREE, and USEFUL resource and fully intend to support them in their continued operation of the site.